For Day 3 week 4 of BM #50, I made this simple fruit yogurt which was a delight to have. My little one is fond of her yogurt be it Greek yogurt or the regular homemade yogurt. When I asked her if she would like to have a fruit yogurt at home, she was all smiles. As a bonus, she said she would help me make it. What I find is the kids eat the stuff they help in preparing. So one more healthy snack for the kids. I was thinking I should have made the fruit preserves at home but that is for the next time. Heat the milk until it bubbles up and a cream layer forms. Set aside until it is warm to touch. Add the yogurt culture into the milk and gently mix. Arrange two glass containers (I used 2 glass cups) and add a tablespoon of preserves in each of the containers. Divide the milk (which has the yogurt culture in it already) into the two containers, cover and keep in a warm place for the yogurt to set. (I usually keep it in the oven with just the oven light on). The fruit yogurt is ready to be enjoyed in 6-7 hours. Mix the fruit which is in the bottom or if you are like my little one, eat the yogurt and eat the preserves as is in the end!! Check out the Blogging Marathon page for the other Blogging Marathoners doing BM# 50. For Day 2 week 4 of BM #50, check out this healthy version of a sandwich. 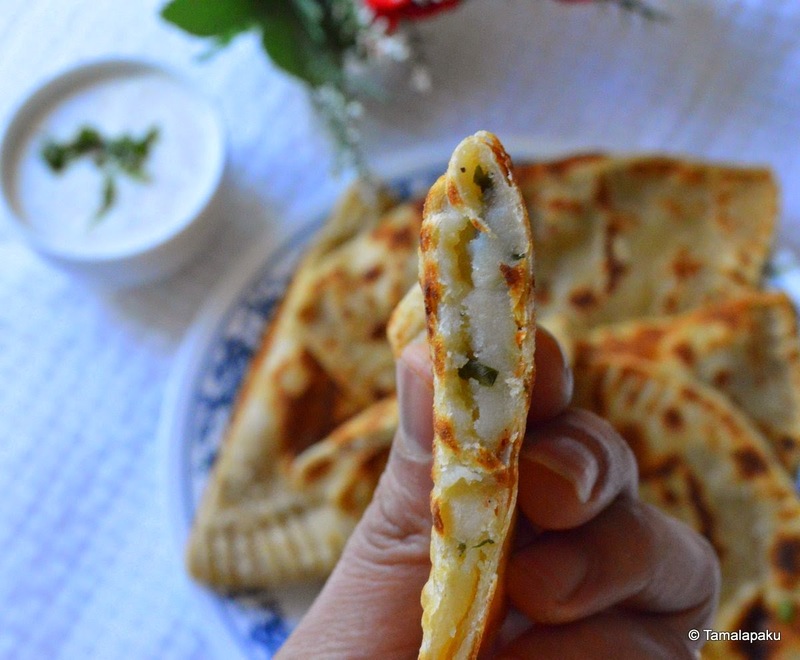 I typically make this when I have left over Pesarattu batter. It makes for a quick bite when in a rush. It is a great idea for either breakfast or an after school snack. Soak Moong dal in about 2 cups of water for 2 hours. Grind the soaked moong dal with green chilies and ginger to a smooth batter adding very little water. Apply some butter on one side of the bread slice and the moong dal mixture to other side. Place the buttered side on the tawa. Flip it and cook on the other side as well. Remove and toast the remaining slices as well. Serve warm with ketchup or enjoy as is. For Week 4 of BM #50, I chose to make some snacks from a list. I have been intrigued by the green smoothies which are all the rage these days. I was very skeptical to try this smoothie but went ahead with it anyway and I am happy that the smoothie didn't disappoint me. The spinach was not overpowering and I felt that it didn't lend any specific flavor. I am sure I am going to make this smoothie for myself. Blend all the ingredients into a smoothie. 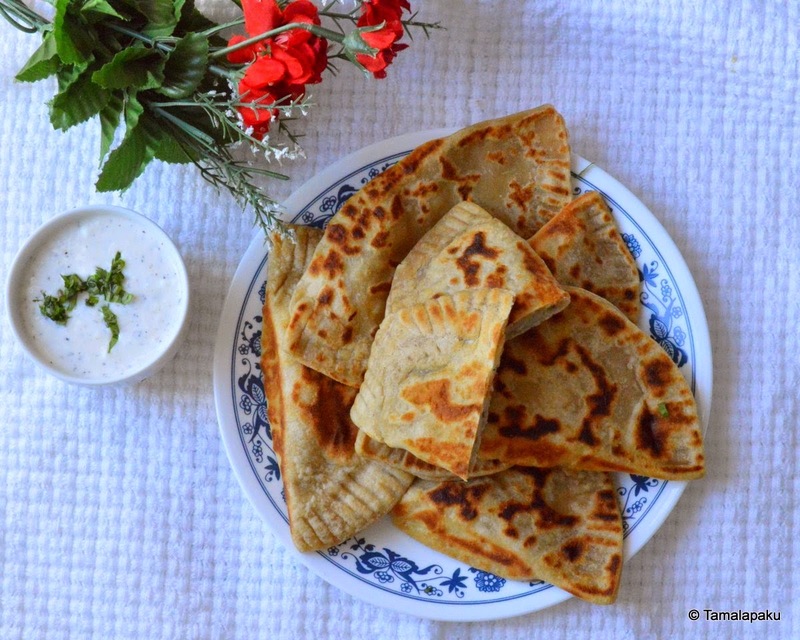 For Day 3 Week 3 of BM #50, check out these delicious Bolanis, a typical Afghani flatbread. While I was making these Bolanis at home, I was having a phone conversation with my sister, Jaya. 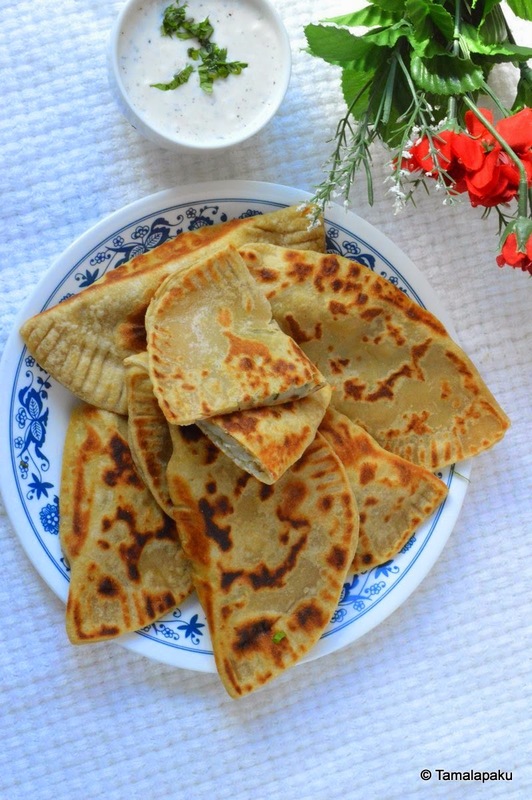 When she came to know that I was making Bolanis, she was surprised and told me that they frequently get these from a local Afghani restaurant. How cool is that, right? Apparently it is one of their favorite flatbreads and they often get them for dinner! It is typically made with All Purpose Flour but I added a little whole wheat flour to make it slightly healthy :). In a mixing bowl, add the flours, salt, cooking oil and water to knead into a soft and pliable dough. Cover and set aside in a warm place for about an hour. Boil the cubed potatoes and mash them adding in salt, pepper and coriander leaves. Mix in the sauteed onions and set aside. Pinch equal portions of dough. (I got about 12 of them). Roll each of the portion into a flat circle. Heat a griddle / tawa and drizzle some oil and place the prepared semi circle filled with the potato mash. Cook on both sides until they turn golden brown. Repeat for the remaining portions of the dough. Serve with plain yogurt or raita as I did. For Day 2 Week 3 of BM #50, check out these traditional Scottish Bannocks. As I understand these Bannocks were also called Oatcakes as they were originally made out of oat flour. Later on these were made popular by the North American settlers in Canada. These Bannocks are basically pan fried bread made with basic ingredients. I felt the usage of a leavening agent was redundant here. I am sure the original version didn't have it either. In a mixing bowl, add the flours, baking powder, cinnamon powder, salt and the dried cranberries. Rub in the olive oil and mix well. Add in warm water to the flour and gently knead into a soft dough. Heat a griddle on medium to low heat. Drizzle a little butter/oil onto the griddle. Divide the dough into 6-7 portions, pat each portion into a 1/2 cm thick pancake and gently place it on the griddle. Brush some more butter/oil on top and let it cook on low heat for about 3 minutes or until the underside is brown. Flip and cook on the other side as well. 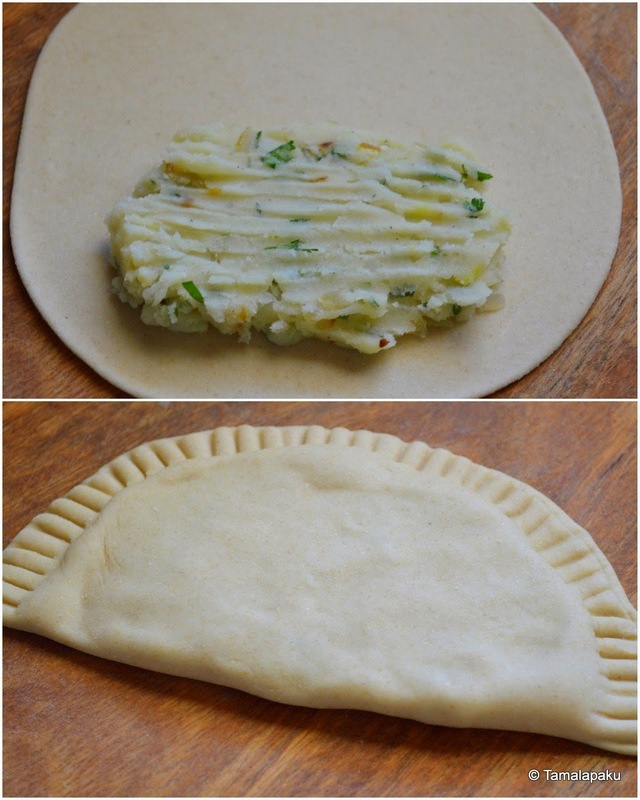 Remove and cook the remaining portions of the dough. Serve warm with your choice of Jam. For Week 3 of BM #50, I have chosen to highlight some flatbreads from around the world. For Day 1 here is an Irish flatbread. There are multiple version of these farls. Typically they are quartered out of a circular pancake but I made them circular and it was a major hit with the kids. Boil the potatoes and mash them adding salt, pepper and butter. Sift the flour and baking powder and mix it into the mashed potato. Adjust the flavors. Knead into a soft dough. Cook both sides of the pancake on a heated griddle drizzling butter as needed. Check out the Blogging Marathon page for the other Blogging Marathoners doing BM# 48. For Day 3, week 2 of BM #50, I found these very interesting burger ideas here and out of the numerous options, this hummus-Avocado burger found its way into our menu. It is so very versatile and flexible to accommodate a variety of taste buds. Toast the burger buns and apply butter as needed. Apply a thick layer of hummus on one side of the bun. Layer the vegetables as preferred. I arranged lettuce, avocado, onion and tomato in that order. Sprinkle the shredded cheese and top it with the other half of the bun. Serve immediately. I served it with some baked potato fries. For Day 2 week 2 of BM #50, here is a vegan version of the popular Sloppy Joe. I wasn't too sure if my folks at home would appreciate this but decided that the risk was worth it :). The best part of this adventure was that both the kids and the dad were mightily impressed and did complete justice to their meal. The lentils are full of protein, fiber and iron as well. I was just not able to convince them to go with some whole grain buns. :) Otherwise with all the vegetable toppings I think it was a relatively healthy meal. In a pressure cooker or a heavy bottomed pan, heat oil and saute the garlic and onions until they are lightly brown in color. Add in the chopped celery and pepper. Let them cook for a minute or two. Add in the tomatoes and tomato paste. Let the tomatoes turn mushy. Sprinkle the cumin powder, chili powder and salt. Pour in the Vegetable broth and let it come to a slow simmer. Wash and drain the red lentils and add them to simmering broth. After the pressure cooker is cooled, remove lid and mix well. Toast the burger buns, apply butter and spread some lettuce, pour the cooked lentils on one side of the bun, add whatever toppings you prefer, top it with the other side of the bun and devour!! For the second week of BM #50, I shall showcase some classic American Vegetarian Sandwiches which are popular at my place. For Day 1 here is the ever popular Grilled cheese sandwich. It is a popular choice with the kids when we visit a local eatery. It so happened that I have recently acquired a grill pan and was itching to use it. Heat a grill pan or a griddle on medium heat. Apply butter to one side of the bread slices. Place 2 slices of the buttered sides down on the pan. Spread as much of the shredded cheese as desired on the un-buttered side of the bread slices on the pan. Top them with the un-buttered sides of the other 2 slices. Gently press down using a spatula and carefully flip the slices to cook on the other side. Make sure both the sides are evenly browned. Serve warm with Tomato soup for a lovely meal. For Day 3 Week 1 of BM #50, here is a classic Gujarati snack which is healthy and tasty at the same time. It has been in my to-do list for a long time now and I was able to make it for a potluck party. I felt it was a perfect balance of all the flavors. Some might want to add in a little spinach as well to balance the bitter taste of the methi leaves. In a mixing bowl, add the wheat flour, besan, ginger, green chili, salt, sugar, red chili powder, garam masala turmeric. Rub in a tablespoon of oil into the mixture. Add in the methi leaves and mix well. Squeeze in some lime/lemon juice as well. Adding as little water as needed, knead into a stiff dough. Divide the dough into two portions and roll each portion into a 1 inch diameter log. Place them in a steamer and steam for about 17-20 min. Remove and allow them to cool for a few minutes. Then slice them into 1 cm thick circles and shallow fry them in a tablespoon of oil until they are golden brown and crispy. Meanwhile prepare the seasoning of mustard seeds, sesame seeds and asafoetida and pour it on the shallow fried muthia. Serve warm with any chutney of your choice or enjoy as is! Makes approx 20-25 1-inch discs. For Day 2 week 1 of BM #50, here is a classic Kashmiri dish. I recently came to know that Chaman in Kashmiri means Paneer. I came to know that sometimes Palak/Spinach is used to circumvent the bitter taste of the methi leaves. I have not used it in my recipe here but feel free to add it. We didn't find the slight bitter taste objectionable as we all love methi in all its glory. In a heated pan, add a tablespoon of oil and saute paneer cubes so they are golden brown in color. Boil milk and transfer the sauteed paneer cubes into the hot milk and set aside. Use the same pan and add the remaining oil. Add cumin seeds and let them crackle. Saute the onions and ginger-garlic paste until golden brown. Grind the ingredients listed under 'To grind' and add the powder to the onion mixture. Sprinkle turmeric and coriander powder. Blanch the methi leaves and add it to the onion mixture. Sprinkle salt and red chili powder as well. Add a few spoons of water and let the flavors blend in. Drain the paneer from the milk and add the milk to the methi mixture and let it come to a boil. Add the sauteed paneer cubes and let it cook for a few minutes. Remove from fire and serve hot with Roti/Pulao. It has been a wonderful journey of blogging with my friends at The BM Group. Kudos to the group for sticking together and blogging together for 50 months. Three cheers to the group and a special mention for Srivalli for keeping the group interesting !! For this week I have chosen to highlight some dishes which feature Fenugreek leaves / Methi leaves. It is very well known that they are very nutritious and good for keeping our blood sugar levels healthy. So for Day 1 week 1 here is a no-nonsense everyday kind of saute which is a delight to have. In a heated pan, add oil and add cumin seeds. After the cumin seeds crackle, add red chilies and asafoetida. Sprinkle turmeric and coriander powder. Toss in the cubed potatoes and saute until they are golden brown all over. Add in the methi leaves, sprinkle a few drops of water and let the methi leaves cook. Also make sure that the potatoes are cooked through. Add salt, red chili powder and amchur powder. Remove from heat and serve hot. It tastes best as an accompaniment to Kadi and Rice.